NORTHBROOK, Ill., Oct. 17, 2018 /3BL Media/ – The Allstate Foundation today announced a five-year, $45 million commitment to empower millions of youth to build social and emotional learning skills like resilience, self-awareness and conflict resolution. “Empowering young people by harnessing their talents and passions will build a better world,” said Allstate Chairman, President and CEO Tom Wilson. “We believe these skills will inspire youth to be leaders and history-makers and achieve their full potential.” The Allstate Foundation is committed to leading efforts to reach 25 percent of the nation’s youth with social and emotional learning programs by 2022, at which time it will have invested nearly $70 million. Research shows social and emotional learning skills result in immediate and long-term improvements in educational achievements and are a better predictor of success and well-being than academic aptitude alone.1 To bring awareness to the importance of social and emotional learning and drive increased demand for programs that enable youth to build those skills, The Allstate Foundation is lining the National Mall in Washington D.C. with monument-like pedestals with aspirational inscriptions such as “Farmer to End World Hunger,” “Teacher to Solve Global Illiteracy,” and “Architect to Eliminate Homelessness.” The campaign illustrates how developing critical social and emotional skills today, can lead to a brighter future tomorrow. With help from Allstate Foundation Good Starts Young ambassador, actress and youth advocate Monique Coleman and actor Lonnie Chavis, youth are encouraged to step up onto the pedestals that inspire them, snap pictures, and share how they can learn leadership today to leave their mark tomorrow via social media with #GoodStartsYoung. The Allstate Foundation Good Starts Young pedestals lining the National Mall in Washington, D.C. are available to the public through Sunday, October 21. 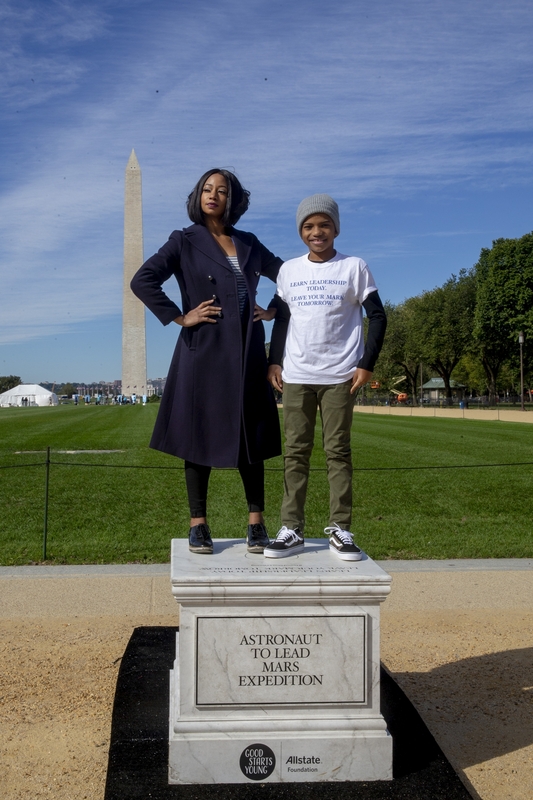 As part of The Allstate Foundation’s Good Starts Young national campaign, youth across the country can access custom Snapchat and Facebook lenses that turn them into a statue-like bust, featuring a title that captures their ultimate leadership goal at GoodStartsYoung.org. Youth can share their customized photo with friends, family members and others to empower each other to be history-makers – and start talking about and building social and emotional learning skills today. To learn more about The Allstate Foundation’s mission to prepare today’s youth for the future and build our next generation of leaders, visit GoodStartsYoung.org and follow along on social media (Facebook, Twitter, Instagram). Good Starts Young is a signature initiative of The Allstate Foundation, an independent, charitable organization made possible by subsidiaries of The Allstate Corporation. The Allstate Foundation works to create more prosperous communities where people are empowered to fulfill their hopes and dreams by inspiring the next generation of leaders, breaking the cycle of domestic violence, closing the nonprofit leadership gap and honoring Allstate volunteers. More information is available at AllstateFoundation.org. 1Citation: DePaoli, J.L., Atwell, M.N. and Bridgeland, J. (2017). Ready to Lead: A National Principal Survey on How Social and Emotional Learning Can Prepare Children and Transform Schools. Civic Enterprises with Hart Research Associates. A Report for CASEL.